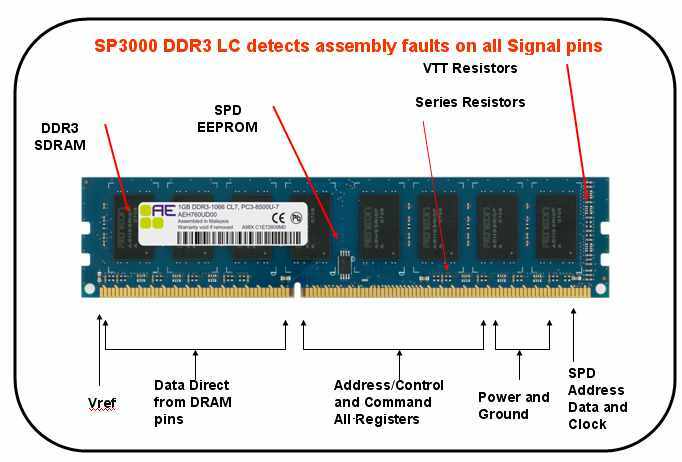 Difference between DDR2 and DDR3 modules. As DDR2 prices climb over DDR3, the switch to DDR3 modules is inevitable. With the help of Window 7, the avalanche is about to start. Many DIMM manufacturers thought that the transition from DDR2 to DDR3 would be trivial but they do not realize that the difference can be their major manufacturing and testing challenges. DDR3 modules run at higher frequency and, therefore, require more attention to signal integrity. PCB trace impedance and line length balance rules must be observed. DDR3 module has added termination resistors on the Address and Control Lines per JEDEC standard. Any wrong value, short/open will be hard to detect by ordinary test method. DDR3 data line (DQ) series resistors are extremely tight in value to stretch the working margin at high frequency. The resistor value tolerance is thus very important. Besides, DDR3 is in micro BGA package makes it difficult to visualize the solder fault underneath the memory chips. Hairline shorts look like an inductance at high frequency and are not always detected by functional test. 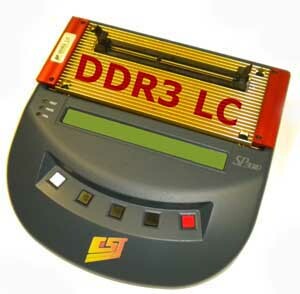 As we migrate from DDR2 to DDR3, the working mechanism of the module becomes more sophisticated. First is the Fly-By clock and the self calibration to make sure the clock arrival time is in synchronization with the Data Strobe (DQS) lines. That means the test system will have to have a smart self calibration mechanism like the computer motherboard. Any failure in calibration will cause an otherwise good module to fail. The mechanism is also called “write leveling” or “read leveling”. There are major differences in DDR3 RDIMM (Registered DIMM). The register chip on DDR3 DIMM comes with the PLL and Registers all in one package. 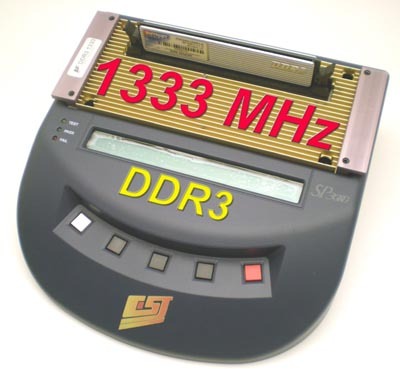 Besides, these DDR3 register has many unique programmable features to tailor the module to different environments. For example, the output driver strength can be adjusted higher in the case of a multi-rank module that has heavy memory chip loading. Smart parity features also allow self monitor of non-performing circuits. DDR3 SODIMM is also different in structure. The address lines on a 2 rank SODIMM module are “non-mirror” on the back side of the module. You see that on a regular long DIMM, the address on the second rank is always “mirrored”, that means the address order is reversed from the first rank. This mechanism explains why many SODIMM would not test on a regular motherboard even using test converter. On top of that, there is High Current 4 rank registered DDR3 module that draws tremendous standby power. These modules are made with 36 die stacked memory chips essentially loading the module with 72 chips load. These modules draw high average current up to 8Amps and will fail on most DDR3 memory testers on the market. Due to the above reasons, a modern memory module factory would adopt new test procedures specially designed for DDR3 module testing. The first stage would be a “pre-test”. This is a functional test coupled with a DC parametric leakage test to catch all the short/open plus gross functional issues. Since it is a “pre-test”, it has to be done in high through speed and very low cost. CST, Inc. supplies the Model SP3000-LC tester together with the Robo-Mini automatic handler especially for this. The tester has built-in functional test to cycle out bad cell in the DRAM memory. It also has leakage test especially geared towards detecting shorts, opens, as well as termination resistor and series DQ resistor problems. In other words, the tester is to guaranty that the module is ready for the next stage of test. The next stage is the mother board test. 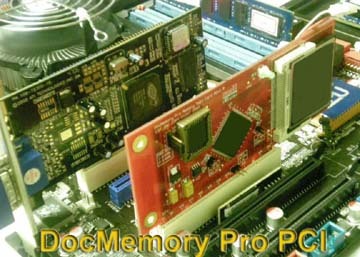 Manufacturers would use a real system board to boot and memory diagnostic to screen through the memory. 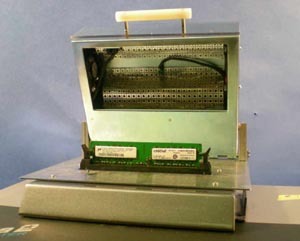 CST’s DocMemory PCI card would fit into this case and perform the “jump test”, “moving inversion” among many other tests. The special software would report test failure and pin-point the bit and the chips that fails. The last step in testing is “RMA Recovery” test. The modules failed the “pre-test” and “motherboard test” will need troubleshoot and repair to put them back into the flow. The common issue at this stage are either wrong SPD information or just dirty gold finger contacts. An SP-3000-LC tester would catch the obvious problems. A more advanced tester like SP3000-1333 or Eureka 2 tester would come into use to discover the non-obvious problems. Whether it is speed issue or operating voltage problem, the advanced testers would tend to catch them when over-clocking and extreme voltages are applied. Since RDIMM works in environment that needs extreme reliability, additional tests are preferred exclusively over RDIMM and high value modules. A quick burn-in test would reveal cold solder joints as well as weak semiconductor junctions. CST, Inc, provides a rapid-heat chamber that can heat up a module rapidly before test. Since heating source is through optical radiation, the temperature rise is very quick. A memory module can rise from room temperature of 25 deg C to 70 degree C in a matter of 5 seconds. OEM customer determined that this is an essential test for registered modules. CST, Inc. with 27 years experience in memory module testing understands the need of this industry. It maintains forward research and anticipates needs and solutions for the memory module manufacturing industry. Please come into our Website (www.simmtester.com), ask questions, and share the answers we have developed especially for you.